Cozumel is a popular place, and the reasons are obvious: beautiful beaches, clear water full of tropical fish, terrific food, friendly locals, and a convenient transportation infrastructure to get you around. If you're arriving on a cruise, there are so many activities that you'll have a hard time deciding what to do. Snorkeling is clearly a popular option, especially given that a marine sanctuary sits right off the coast that protects beautiful reefs, thousands of species of tropical fish, and sea turtles. Or, head inland to see the Mayan ruins, the jungle paradise, and local villages. Or, do both! Many excursions combine multiple activities so that you get the best of the sea and the land. 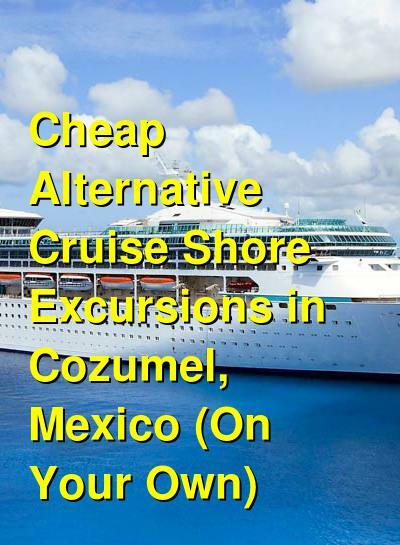 Get picked up at the port (or your hotel) for this highly rated tour in a Jeep to some of Cozumel's best sights. Drive yourself (a guide comes with you) through the jungle to the national park. Go snorkeling in the clear blue waters off of Cozumel's stunning shore. Visit archeological sites to learn more about the ancient Mayan culture. Meet sea turtles. Visit a tequila factory! And have an amazing Mexican lunch, too. This tour lets you customize your options so that you can enjoy the things you want to do while avoiding anything you wouldn't want to do. It's also fun for kids. This is the ideal activity for anyone who doesn't have much time, but wants to do everything. Perfect for families, couples, or anyone who loves the water, this snorkeling and beach trip promises plenty of fun activities. It combines a snorkel trip, a visit to a small water park, and a buffet lunch with drinks. First, your guide will take you to a reef in the nearby Cozumel Reefs National Park, where you will see plenty of tropical fish and coral, along with sea turtles and other underwater creatures. The water is clear and blue, and very calm, so it's great for everyone. Snorkel equipment is provided. Next, you'll head to Playa Mia Grand Beach Park, which is a small water park on the beach. It features several water slides, beautiful swimming pools, and a white sand beach opening up to clear, calm waters. Out in the water is a floating play structure, which is also plenty of fun. You really need to see the photos to understand how great this trip will be, especially for kids. (Optional activities include massages, jet ski rental, a spa and salon, parasailing, and more.) Included on your tour is a cocktail or a beer, and a very nice Mexican buffet lunch. If you only want to visit Playa Mia park without the snorkeling trip, see the tour below for tickets. This ticket gives you access to Playa Mia. Transportation from the cruise ship pier is a small add-on, and other options include a buffet lunch and an open bar. This small but terrific pool and beach park offers so much for both adults and kids. Long water slides and fun swimming pools await you. And so does the beautiful beach and clear water. A floating play structure sits in the waters just off of the beach too. This park also has a spa and salon, restaurant, bar, kayaks, paddle boards, parasailing, jet skis, and other fun water activities. Check out the photos! If you're looking to just relax and have fun, or if you need something that kids would love, this is a great option. If you love food (and who doesn't? ), we highly recommend this amazing culinary tour to some of Cozumel and San Miguel's best local restaurants and eateries. Your knowledgable guide will take you on a dining adventure to several places where you can experience local dishes to the Yucatan. All food and transportation is included on this trip, so just sit back, relax, and eat! This terrific trip meets at the cruise terminal and combines a snorkeling trip with a fun ride on an electric bicycle and stops at several interesting places. Don't worry, the guides will adjust the bike for you before everyone heads out onto the bike trail (bike helmets are included). Visit an underground river in a cenote and then see the botanical gardens along the way. The next stop is Sky Reef Beach, where you will have a chance to snorkel in the beautiful clear waters and see tropical fish and coral. Snorkeling gear is included, too. After snorkeling, relax on the beach for a little while. Along the ride back, you will stop at a tequila distillery to learn all about how it's made. Whether this is your first time on an ATV or if you're an experienced rider, this exciting adventure through the jungles to an underground river will thrill anyone. Your experienced guide will give you a safety overview and show you how to ride the ATV's before heading out into the jungle. You will make your way along muddy paths to a cenote, which is a cave with an underground swimming hole. Here you can swim in the clear waters (life jackets provided) and relax in the cool waters with your new friends.